M400 is an exceptional blend of sporty design, integrated GPS and advanced training features. 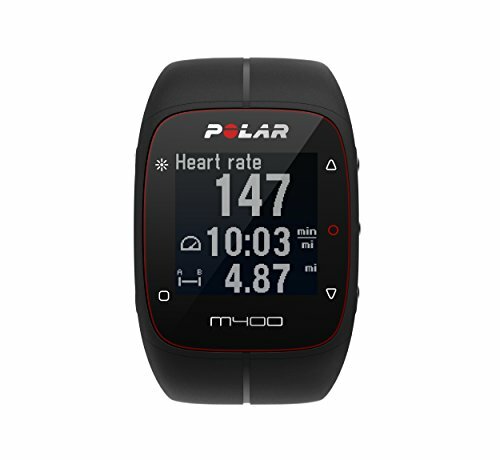 It takes the best of wearable activity trackers, integrates full GPS and advanced training features and provides you with meaningful data that helps you make improvements in your lifestyle and training program. Lightweight and compact, M400 is designed to be worn all day. With its high-contrast and high-resolution display, M400 is the perfect companion for outdoor use, at any time of day. Its 24/7 activity features help you reach your daily goal and motivate you to keep moving throughout the day. Measures your pace, distance and altitude with integrated GPS. Incorporates loads of traditional and unique Smart Coaching training features to help improve your performance: automatic laps, interval timer, finish time estimator, Sport Profiles (adjustable), personal best tracking, running index (develops your running performance). Connects to Polar Flow mobile app and web service where you can sync, share and plan your workouts. Polar Flow Relive feature replays video highlights of your workout journeys and enables you to share with friends. Compatible with the H7 Bluetooth Smart heart rate sensor (sold separately, not included). Water resistant. Rechargeable battery. Battery life: up to 9 hours training time (when both GPS and HR in use), 24 days in time mode with daily activity monitoring.